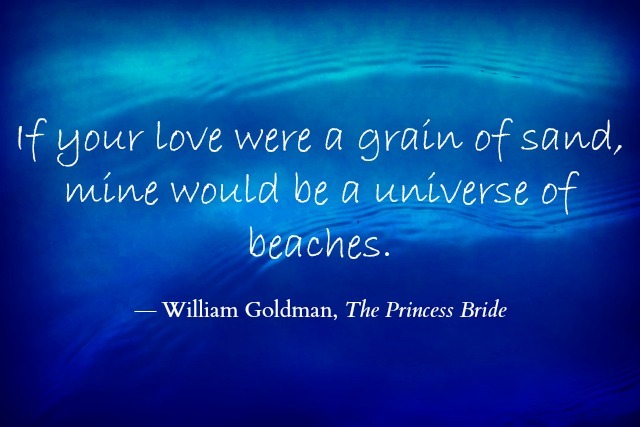 In honor of William Goldman's birthday, which is right around the corner (Aug 12th), let's celebrate with a quote from his classic novel, The Princess Bride. The Princess Bride (novel and movie) is infinitely quotable and you probably have many other favorite quotes (as do I). However, I just love this quote from Wesley to Buttercup when she asks if he loves her. Just gorgeous. While Goldman is known to we book-lovers principally for The Princess Bride, he is actually more well-known for his impressive body of work as a screenwriter including hits such as Butch Cassidy and the Sundance Kid, All the President's Men (for both of which he won Oscars), Chaplin, Indecent Proposal and the upcoming Heat (2014). Goldman and Stephen King seem to have quite a collaboration going with Goldman adapting several of King's novels for the big screen including Misery, Dolores Claiborne, Hearts in Atlantis and Dreamcatcher. So. happy birthday, Mr. Goldman! Thank you so much for many an entertaining hour!